Looking for the best image stabilized binoculars for birding, sporting events, boating trips, safaris, astronomy, air shows, or simply for watching passing ships from the beach? Or just want a pair because your tired of looking through your other traditional binoculars that can't provide you with a steady image, especially at higher magnifications, and don't want to lug around a tripod? We've done some reviewing of the most popular brands in 2019 including Canon, Fujinon, Zeiss, and Nikon (although Nikon StabilEyes has been discontinued but still available for purchase online) to help you decide what would best fit your needs. What are the best image stabilized binoculars? Canon stabilized binoculars come in several magnifications with various objective lens sizes: 8x25, 10x30, 10x32,10x42, 12x32, 12x36, 14x32, 15x50, and 18x50. Their newest line that has Powered IS (Image Stabilization) Technology includes the 10x32, 12x32, and 14x32 models. I noticed on the Canon Image Stabilization Binoculars product page that the binoculars were listed as 10x30 IS and 10x30 IS II or 12 x 36 IS II and 12x36 IS III. "I have located the 12 x 36 IS III and the 12 x 36 IS II binoculars. In this case the IS stands for image-stabilized operation. The III stands for the newest of the two 12 x 36 IS III binoculars, released in 2015, the 12 x 36 IS II in 2004." Demonstration of Canon Image Stabilized Binoculars with Stabilization Turned On and Off. This is a quick demonstration of how much the image stabilization makes a difference when viewing an object with and without it turned on. You can see the visible shake with it turned off. Fujinon does not carry as wide as a line as Canon, but their Techno-Stabi line is of high quality and worth taking a look at if you are considering Canon's in the same magnification range. Fujinon has a new 12x28 compact image stabilization binoculars as well as a 14x40 pair. Canon has 12x32, 12x36, and a 14x32 models for comparison. Cons: Not waterproof - has a IPX-2 rating (explained below), uses a CR2 battery which is not as easily as replaced as AAs in Canons (with the exception of Canon's 8x25 which takes a CR123A battery), FOV is narrow at 218.00' @ 1000 yd / 72.38 m @ 1000 m.
The 14x40s we think are better suited for astronomy or boating or viewing sporting events, etc., because they are rather heavy and cumbersome (bulkier) for birding hikes, and have inadequate eye relief for eye glass wearers. Waterproof ratings range from IPX0-IPX9K. Obviously, a 0 rating has no water resistance, and a IPX9K rating gives protection against powerful high temperature water jets. 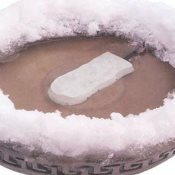 Protection against: Dripping water when tilted at 15°. Effective against: Vertically dripping water shall have no harmful effect when the enclosure is tilted at an angle of 15° from its normal position. A total of four positions are tested within two axes. Test duration: 2.5 minutes for every direction of tilt (10 minutes total) Water equivalent to 3 mm rainfall per minute. More here about the IP code at wikipedia. "This will protect your thingy from some water drops when the device is tilted up to and including 15°. If you have your device at 16°, you are screwed, sorry but there are limits in the world." Canon's only truly waterproof model is the 10x42 L IS WP. The "L" stands for the L-series lens with 2 Ultra-low Dispersion (UD) elements on each side. The Canon 18x50 IS All Weather model is water resistant. "Unfortunately, IPX ratings are not available for them. I realize this is disappointing. I found it is recommended to avoid exposing the 10x32 IS to rain or water spray. The Canon 18x50 IS All Weather are water resistant enough to use in rain but are not for underwater use. The 10x42 L IS WP IS WP are waterproof but are not for underwater use. There is a section on maintaining the waterproof property in the 10x42 L IS WP's manual. You may click here for a PDF copy from the Canon U.S.A. site." "The StabilEyes is an archived model and no longer manufactured." Their archived 14x40, 12x32 VR, and 16x32 VR models are still available for purchase online at various stores if you prefer them to Canon for Fujinon..
Or if you really want something special, and feel like splurging, why not try the Zeiss 20x60 Image Stabilization Binoculars?! These are pretty cool, or as Zeiss puts it, "a mechanical masterpiece". There are no batteries. The image stabilization system is all mechanical via magnetic damping action and a gimal-mounted spring joint. Like I said, cool. For birding, I would recommend an image stabilized binocular with a 10x or 12x magnification with at least an objective lens size of 30 or above (the Fujinon's 12x28 would be okay, too). So with the Canon IS line, that would include the 10x30, 10x32, 10x42, 12x32, and 12x36 binoculars. Because when you have too small of an objective size with higher magnification, the field of view narrows which makes it more difficult to find birds initially. 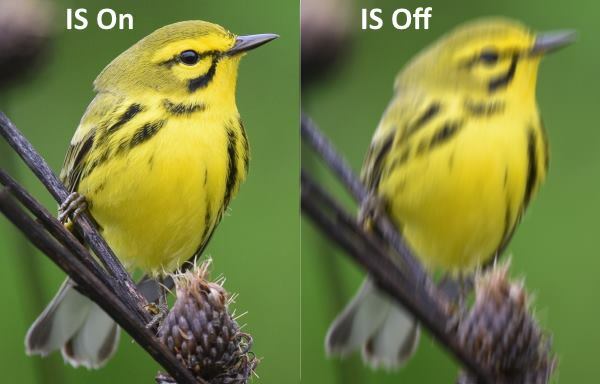 This may not be a problem with all types of birding, but if you are trying to spot a warbler jumping around in a thick conifer, the wider FOV (field of view) is helpful. Why not a higher magnification? As Bruce noted (see discussion below about a visitor who recommends image stabilization binoculars for birding) when he tried the Canon IS 15x50s, I don't think the extra magnification is worth the added weight or the smaller field of view in some models, like the Canon IS 14x32, for most birding applications. The 10x or 12x magnifications I think will allow you to identify most birds without needing higher magnification. Also, close focus often becomes greater in higher magnification binoculars. 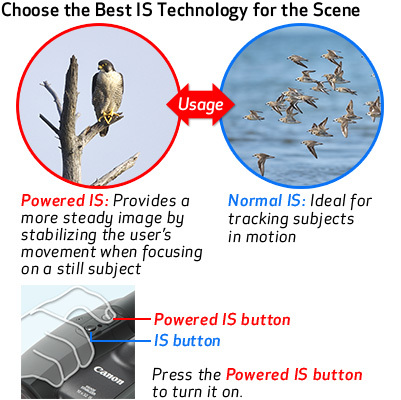 If, for some reason, you are doing more long distance birding, like viewing pelagic or waterbirds from far away, or raptors flying by at great distances, etc., then perhaps the 14x, or even 15x may be a better fit for your birding, but I think most birders, beginners through advanced, would be happy with a 10x or 12x image stabilized binocular. And why not the cheaper and compact Canon IS 8x25? They are small and lightweight, which is good for carrying on birding treks, but that's not why you are getting IS binoculars. The problem comes from when you have your higher magnification binoculars, such as 10x and above, that you get the shaking effect the most without having to steady yourself or the binoculars with a tripod and binocular mount. I'd say, keep your regular 7x and 8x binoculars, if you already have a pair, and buy IS binoculars in a 10x or 12x. Also, the IS system in the Canon 8x25s is not as sophisticated as the other higher magnification models. They also requires a CR123A battery which are more expensive and more difficult to find instead of AAs which the other models use. If you can purchase more than one IS binocular, than it would make sense to get the Canon IS 8x25 or maybe the Fujinon Techno-Stabi 12x28 as a second lightweight pair, especially when traveling, but if you are only going to get one pair of IS binoculars, get at least a 10x or 12x with a wider field of view. 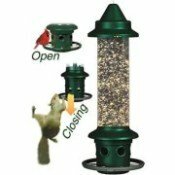 "My wife and I are retired and able to spend much more time birding... If you are new to image stabilization binoculars, I highly recommend looking through a good quality pair. 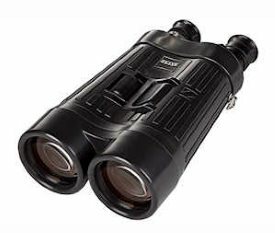 We have Canon IS Binoculars and every time we show them to other birders the response is 'OMG' and then 'Where can I buy these?'" Q: What magnification and objective lens size do you have in the Canon's? A: We have the Canon 10x30 IS and Canon 12x36 IS. I tried the 15x50, but they were not any more useful than the much lighter 12x36 so I returned them (Amazon). Q: Did it take you time to adjust to using them from regular binoculars? A: We did not need to adjust to the new binoculars other than the unpleasant moment when we adjusted to the fact that our cherished conventional binoculars were terribly obsolete. 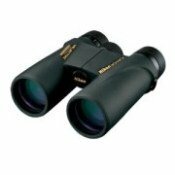 The 10x30 and the 12x36 weigh noticeably less (around 22 and 23 ounces) than our 8x42 binoculars which were around 30 ounces. When we press the IS button, it is, quite literally, as though the binocular is fastened to a heavy tripod with a fluid head. This advance in technology reminds me of the college chemistry class when a student showed me his new HP scientific calculator. After class, I put my cherished slide rule up for sale on the bulletin board :-). I urge you to try a pair, order them on Amazon, they have a 30 day return, no return shipping cost policy. Q: I know some birders have said their IS binoculars are as good as a spotting scope. Has yours replaced the need for a scope? A: I still have the 80mm scope, but after looking through the Canon IS binoculars, I listed and sold our traditional binoculars on eBay. Explantion of image stabilized binoculars.